Have you ever lost sleep over paint chips? Scrutinized a paint swatch in morning, afternoon, and evening light? Picked a paint color, only to second-guess yourself? Then you know how hard it is to choose paint colors. I wish I could tell you the perfect color for every room. But as color psychologist Angela Wright puts it, it’s more complicated than avoiding certain colors. What matters is the intensity. Even blue — supposedly the most calming color — can become overwhelming if it’s too bright, and fearsome red can relax you if it’s a rich, subtle burgundy. Let me explain. In rooms like the bedroom and living room, you want to relax and unwind. For those rooms, pick paint colors that aren’t very saturated, like pastels or something mixed with gray. In rooms where you want to be stimulated and awake, like the kitchen, more saturated and vivid shades will keep you alert (think bright gem tones). With that in mind, I’ll walk you through some of the best paint colors for every room. But ultimately, the best paint color is whichever one you like! 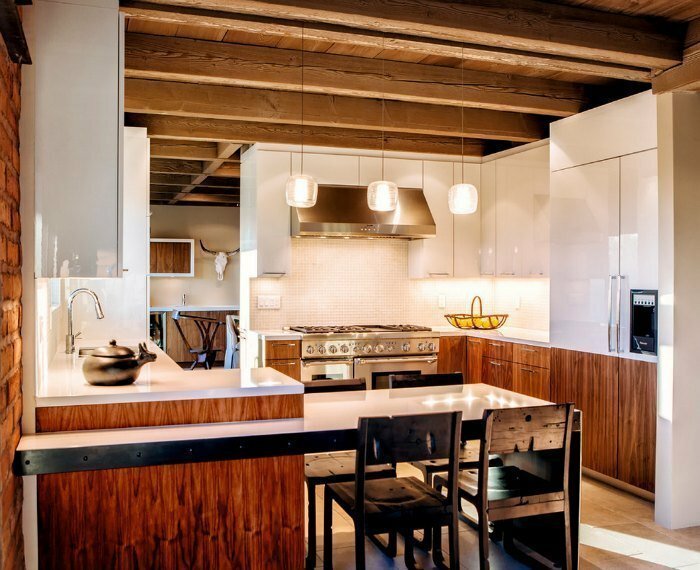 Warm colors like orange and red stimulate the appetite, making them great kitchen paint colors. If you love vibrant orange shades, try Soft Pumpkin from Benjamin Moore or Kumquat from Sherwin-Williams. Both are happy, upbeat colors that aren’t too intense. Supposedly the color orange also helps with digestion. Pick soft colors for the bathroom. They’ll relax you and flatter your skin tone. (It might be tempting to experiment with brights, but in a relatively small room, they can be jarring.) You can’t go wrong with ivory, buttery tan, or a gentle rose. In fact, pale yellow and pink paint mimic sunlight — perfect if your bathroom is short on natural light. Italian Straw by Pratt & Lambert is a gorgeous sunny hue. Aqua accents really pop in a yellow or orange room, too. 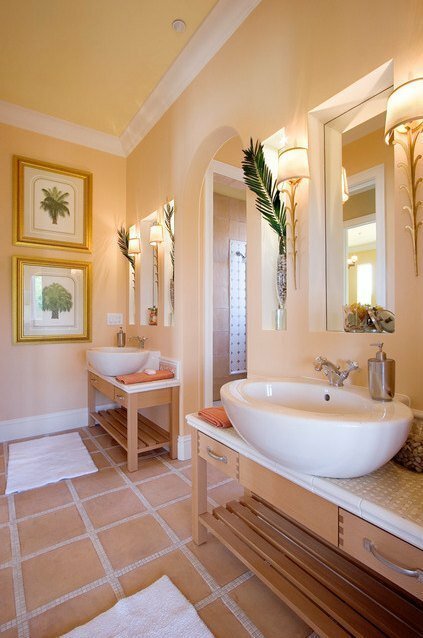 If your bathroom is on the smaller side, paint it a light color like white or lemon to make it look bigger. Or for a coastal vibe, try an airy sky blue. Don’t forget to paint the ceiling. I love the gorgeous Orlando bathroom below. It just makes you optimistic about the day, doesn’t it? Blue’s connotations of sky and sea make it inherently relaxing. It’s not just anecdotal evidence — research shows people get more sleep in a blue room (and the least in a purple one). Navy is a bad kitchen paint color because it inhibits conversation, but that makes it a great bedroom color! And blue paint is also said to lower your blood pressure. Ahhh. If blue bores you, try a modern, icy gray-green like Healing Aloe from Benjamin Moore. It’s a more interesting take on neutrals than white. Or try silver, which reminds the body of moonlight. 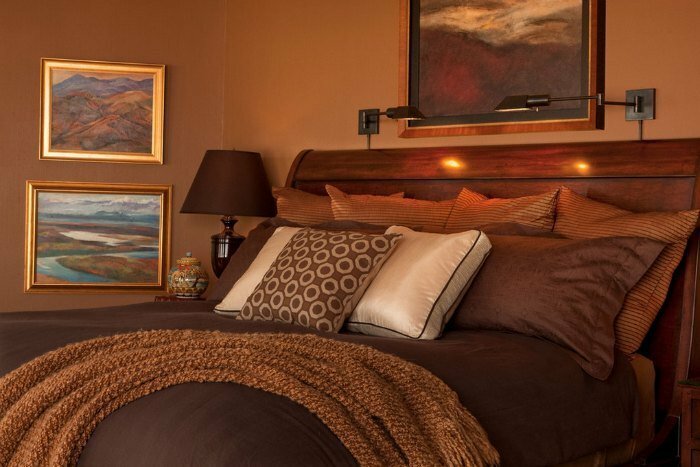 According to the study about sleep and bedroom color mentioned above, people get frisky most often in a caramel-painted bedroom. Just avoid cool, gray-tinted browns, as they can be depressing. Stick with warm honey and chocolate tones. 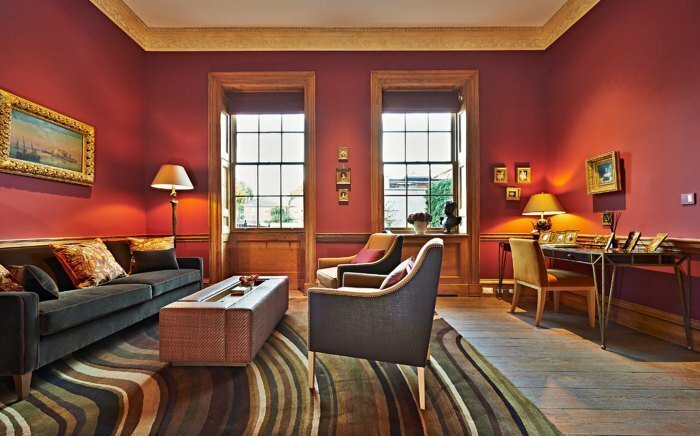 Even toned down, a red living room is not for everyone. Another idea is pale gray paint, which allows brightly colored decor to stand out. 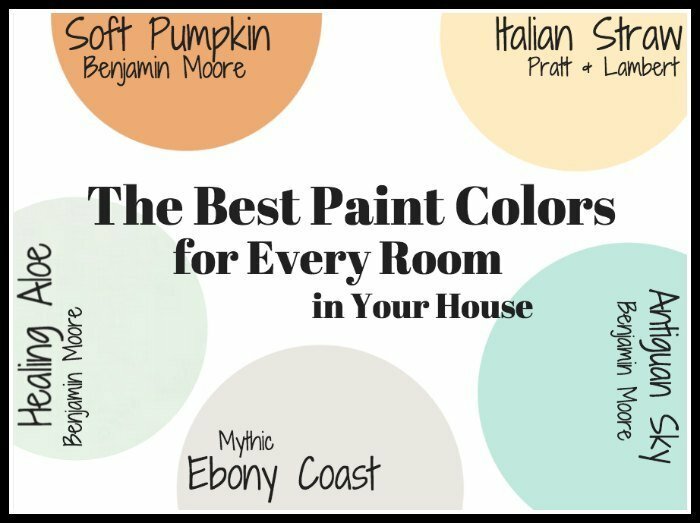 (I’m a fan of Ebony Coast from Mythic, a nontoxic British paint brand.) Of course, a white living room is classic too. Or try teal. It’s livelier than blue and looks sumptuous with jewel tones and velvet furnishings as well as wood. In the office, yellow paint wakes you up and helps you focus. Shades of green also help your brain avoid distractions, even if it’s just a few plants here and there (check out my post on the psychology of interior design for more). 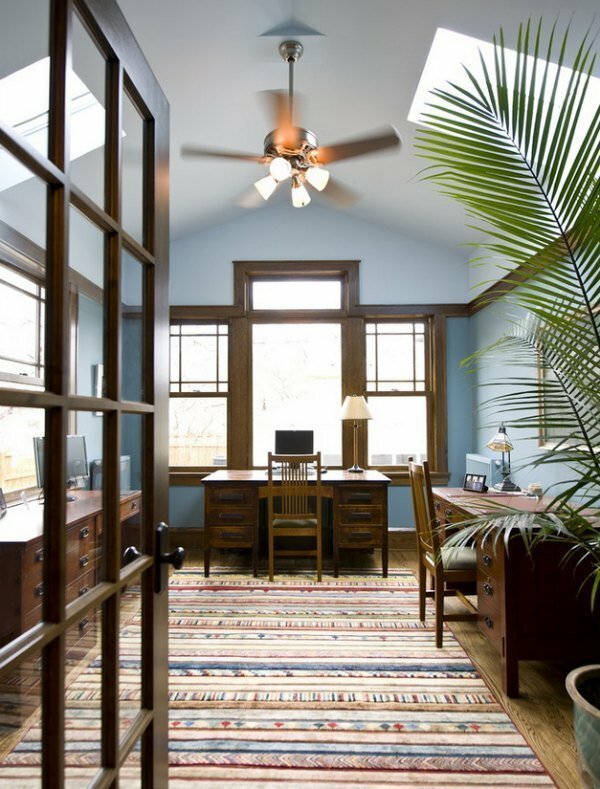 Benjamin Moore’s Antiguan Sky is a creative, modern light aqua that would work well in the home office. Who wouldn’t want to work in this light-filled sky blue office? As always, remember that paint will definitely look different on your computer screen, on a swatch, and on your actual wall. Most paint stores sell small samples for a few dollars, and I recommend getting a couple and painting splotches on your wall before committing to a gallon or more. What are your favorite interior paint colors to use? Tell me in the comments! And if you liked this post, don’t miss related posts I’ve written on the psychology of interior design, 9 ways to make a small room look bigger, and how to create an interior color palette for your home. I LOVE that marsala living room color!! Awesome. I’m trying to find a great color for my kitchen, so perfect timing! I’m always excited to read your next post – always so applicable to what I’m up to in my home remodels. Never been a fan of yellow (anywhere), but that carmel and Antigua Sky are gorgeous. I think I’ll be using that blue in my next room, thanks for another great post – the ideas are flowing. What is the name of the Carmel color? It’s beautiful!